From our behind the scenes images from the photoshoot it is clear to say we were very happy campers! After a week or so of hectic planning and troubles actually getting the van packed, the team were all set to travel to the village of Mundesley on Sunday 21st June. 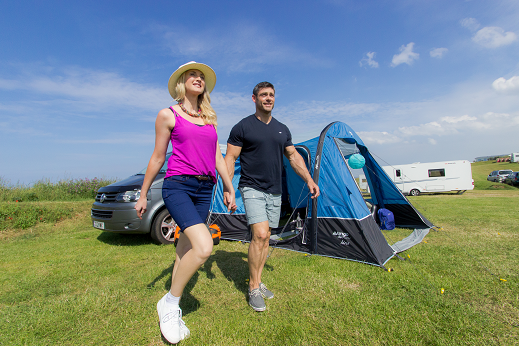 We managed to secure our photo shoot location at Sandy Gulls Caravan Park in Norfolk and our accommodation at Woodlands Holiday Park , which to our advantage was only 5 minutes from the photo shoot site. Apart from the slight coldness and high winds the first few days (which seemed like we'd never left Scotland), Norfolk did us proud in offering some great weather for the rest of the week. Despite the dip in weather our team worked incredibly well together, whether we were in the marketing, product or sales department everything ran smoothly and efficiently ensuring the job was done! Awning after awning, we managed to get through the range reasonably quickly making sure we added some of our massive collection of varied props and dressing items. 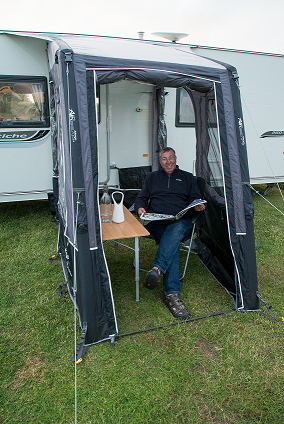 A number of the awnings were a hit with our neighbours on the caravan site, who kindly visited our pitches to check them out more closely. It was fair to say the range stood out immensely at the caravan park, and the kind comments from passers-by really made the team feel proud to be a part of this new exciting collection. We would like to thank Sandy Gulls Caravan Park, who put up with our day-in, day-out running around their caravan site. With our pitches we managed to pitch, pump, and prepare our 18 awnings for photography. 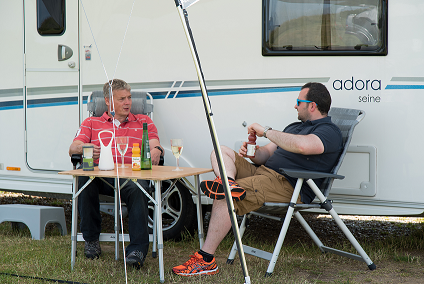 We were able to hire two caravans, a motorhome and a VW campervan for the week to accommodate all of our varied sizes and shapes of upcoming awnings. The location was perfect in capturing all the angles and features of our new range, as well as offering a fantastic backdrop of the lovely Norfolk coast. Another massive thank you to our trusty photographer Terry Abraham, who took every opportunity to capture relevant footage and extraordinary images for our 2016 brochure. We really used the caravan site to the limit, and are very thankful for the site allowing us to venture off-site and down to the beach with the models to maximise our image variety! Check out our sneak peek snapshots and the new awnings in action! Thank you to our models who did an amazing job throughout the week which really made all of our photo’s look brilliant! Here’s a few of the team enjoying a short break in our sun canopy and Braemar!